When army divisions led by General Franco took Madrid on 28 March 1939, one of their first acts was to send a group of Falangist militiamen to seize the offices of the Heraldo de Madrid by force of arms. 75 years on, a commemorative issue has been printed, underscoring the fragile state of Spain's news media. 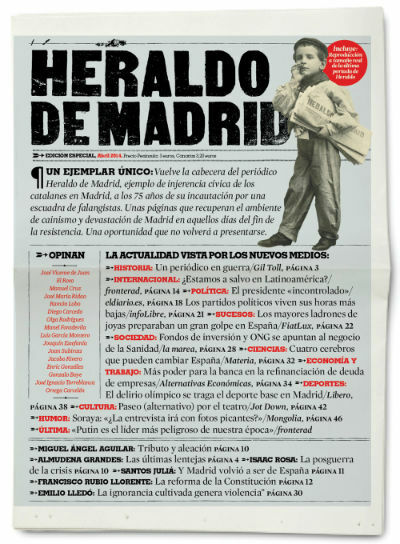 A group of journalists and independent news media from Spain have published a commemorative issue of the Heraldo de Madrid, the staunchly Republican newspaper forcibly closed down by Fascist troops, who seized the paper’s offices and printing presses when they stormed Madrid in 1939. Francisco Franco considered the Heraldo a threat to his attempt to take control of the country. So much so that the Fascist General Juan Yagüe was quite clear when he said back in September of 1936: “The first thing we are going to do when we get to Madrid is “chop off the head of the Editor of the Heraldo de Madrid”. The editor at the time was Alfredo Cabanillas – he was fortunate that the General was delayed in his arrival in Madrid, having been diverted to Toledo in order to relieve those under siege in the Alcazar. Priding itself on being the bastion of free, democratic and liberal journalism and culture in Spain, the Heraldo de Madrid was enormously popular. By the end of 1935 it had a print run of 500,000 copies a day. 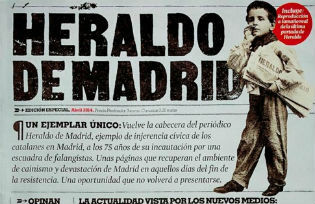 Originally founded in 1892 by Felipe Duzcazal, the Heraldo ended up as part of the media group Sociedad Editora Universal, who to this day have received no compensation for the seizure. The idea of publishing a commemorative issue was the brainchild of some of the major independent news media in Spain, both online and on paper. The one-off isssue of 100,000 copies hit the streets at the end of March, and will remain available for a month, at a cost of 3 euros. Commemorating the event of the seizure by the fascists has the clear political intent of acting as a timely reminder that a free press should not be taken for granted, particularly given the current precarious state of the media in Spain. The commemorative issue was published under the direction of the journalist Miguel Ángel Aguilar, who is the President of the Association of European Journalists, along with new independent media ventures such as infoLibre, eldiario.es, Alternativas Económicas, the satire magazine Revista Mongolia, Líbero, Materia, La Marea, fronterad, Fiat lux and Jot Down who have all contributed articles, some of which recount the history of the newspaper and the contributions of the major journalists who graced its pages such as Manuel Chaves Nogales and César González Ruano. The issue can be seen as a collector’s item, but it is clear that the direct attack on a free democratic press that took place 75 years ago has echoes for the Spanish media today, despite the fact that Spain has been living in a democracy more or less since the death of Francisco Franco in 1975, and officially so since the signing of the new Constitution in 1978. However, Spain has for centuries been a country divided in two. The Liberals and the – at times – shockingly obscurantist pro-Church and Monarchist factions have been at each other’s throats for centuries. The Constitution was welcomed by the vast majority of the country, tired of living under an authoritarian regime, but the document even now appears to only just manage to paper over serious political and social divisions. A certain nervousness can still be detected in contemporary Spain that democracy has not taken root as deeply as many would have hoped. The new online journalism has colonized areas where mainstream journalism now fears to tread, being well aware that political questions that go un-asked will come back to haunt Spanish society. The seizure itself was not a moment of high drama as it is recounted in the article by Gil Toll. Just hours before the Falangists arrived to seize the paper, one of the newspaper’s photographers Diaz Casariego, announced to the rest of the astonished staff that he was taking over the direction of the newspaper in the name of the Falange. He even posted a message on the door to that effect, much to the amusement of the Falangists, who when they finally arrived presumed it was a cunning trick for the newspaper to “seize itself”. The soldiers marched in and found the newspaper staff having lunch – a dish of lentils. Everyone dispersed and went home and in the following days, arrests and summary trials took place. The editor at the time, Federico de la Morena, was sentenced to death but his sentence was later commuted to a term in prison. The newspaper had taken pride in having created a team of Spain’s best journalists and writers, that included Spain’s first female journalist, Carmen de Burgos who wrote under the nom de plume of Colombine, and the world famous poet and playwright Federico Garcia Lorca. Sections of the commemorative issue are an evocation of those heady and dangerous times and the rest is current news and cultural content supplied by the independent providers that are part of the project. It is interesting to note that the news media taking part are mostly new online journals, some portals boasting millions of visitors, a reality that reflects poorly on the lack of reliability of mainstream outlets, who give the impression of being politically compromised. This realignment in the Spanish media was a contributing factor in the project to reprint the Heraldo de Madrid. It was fortuitous that the 75th anniversary of the closure also has come at a time when Spain’s fledgling democratic media is experiencing its first tremors. There is significant upheaval in the world of daily newspapers in Spain, with three editors from the three main newspapers having been replaced in the space of a few months (El Mundo, El Pais and La Vanguardia). The story being told is that a new approach and new blood is required to tackle the problem of diminishing advertising revenues, huge accumulated debt and the exodus of their readership to the web. These issues are clearly a problem, but it looks like the solution the mainstream dailies have adopted has compromised their reputation for hard-hitting journalism. They have merely created more space for the huge number of journalistic web portals that are more than willing to ask the difficult questions and print the news that many Spaniards have been forced to go hunting for. The trend knows no political bias either, both the centre-right El Confidencial and the left-wing eldiario.es and infolibre.es can boast millions of visits per month. This move by big media to cosy up to political and financial institutions could be read either as merely a survival technique or seen as a duty they feel they have to uphold a fledgling democracy they were an inherent part of. But this tactic has raised the issue of conflicts of interest and indeed a new trend towards self-censorship. It would be disingenuous to say that Spain has a serious press censorship problem. Reporters Without Borders classes Spain in 36th position out of 179 countries in terms of freedom of the press. But there is a creeping self-censorship as a result of the politicization of the televised news, the fact that there have been journalists laid off for political reasons and the rather eerie phenomenon of the Prime Minister who only appears to the press via a plasma screen, making questions and answer sessions as difficult as possible. The current government has something of an allergy towards unfriendly press. Fascism has by no means returned to Spain but some journalists, acting as watchdogs for Spain’s new found freedoms, smell trouble.